We had planned to hang around the Village today and let the boys decompress from all the chaos at the theme parks. Turns out this was a very good thing. I woke up in the wee hours, sick. Whew. I was down for the count most of the day. Instead of running around with both of us all day, the boys ran around with Paul. I was either in bed or on the couch most of the day. I couldn’t face any supper except some saltines and Sprite, but I did make it down to the Christmas celebration afterward. While I was worshipping at the altar of the porcelain god, the boys went to the pool and met some special friends. There is a group of girls here on a school service trip from New Jersey. Two of them fell in love with the boys, and entertained them for a long time. 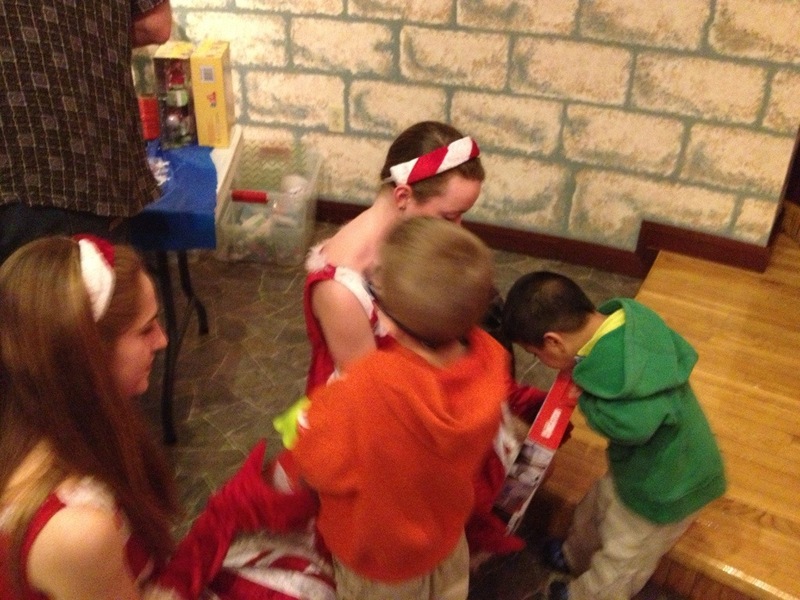 When we made it to the Christmas celebration, there they were, dressed as candy canes. Here is the joyous reunion, with the boys showing off their new presents. I don’t know if I’m going to be able to make it to a theme park tomorrow or not. I am much better, but definitely not running on all eight cylinders yet. Hoping for a good night’s sleep tonight, and that my sickness definitely was food poisoning, and that it won’t be transfered to anyone else.